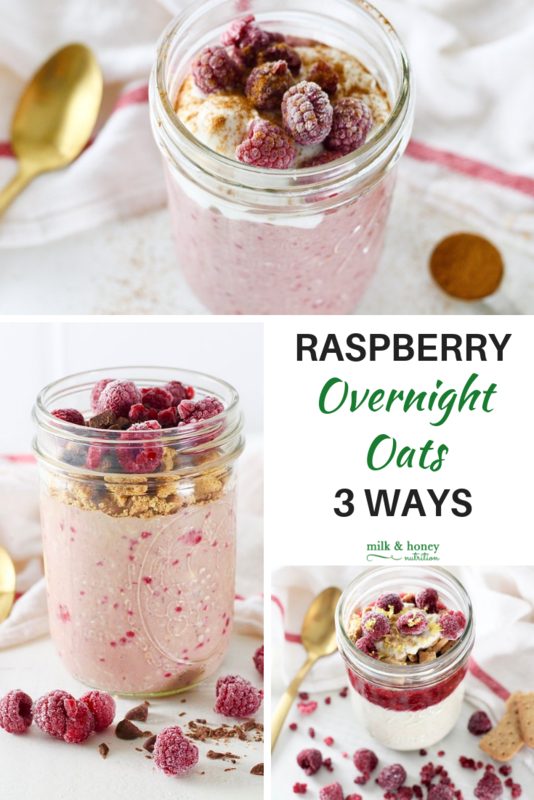 This post for “Raspberry Overnight Oats 3 Ways” was sponsored by Red Raspberries. All thoughts and ideas are my own. Frozen raspberries make an eye-catching and convenient addition to your holiday recipes with all the red and crimson-colored dishes making an appearance this time of year. You can use frozen raspberries to jazz up a quick bread or muffin recipe, bake a beautiful holiday-worthy pie, or even make a warming, beautiful bowl of morning oatmeal. But, for those mornings where standing over the stove for 20 minutes isn’t possible or a simple bowl of oatmeal won’t cut it…. Since you might be hosting friends and family this time of year, easy crowd-pleasing breakfast recipes – one that will fuel your busy mornings – are a must. While I’m sure you’ve heard of overnight oats (or have even tried them yourself! ), these three recipes below are the creamiest, most soul-satisfying overnight oat recipes you’ll ever enjoy! Each recipe has the same base formula, as well as frozen raspberries, and their own unique flavorings to make them special. Each person can customize their overnight oats however they’d like. Think of it as a build-your-own breakfast station, but an overnight oats version fit for the holidays! For example, I like to keep my meals lower in added sugar, but feel free to offer maple syrup or honey for those with a sweet-tooth. If you’re in need of dairy-free options, provide non-dairy yogurt and plant-based milk alternatives. You can even swap-out the oats for chia seeds or flax seeds for a great breakfast pudding! I hope these three recipes serve as some helpful, holiday breakfast inspiration!